Every year, when Beltane rolls around, parents start discussing whether they are comfortable with the sexual fertility aspect of the season for adults, and whether they can reign things in just a little when it comes to practicing with their young children. After all, you may just not be prepared to explain things like the erect phallus of the god to your pre-schooler, and that’s totally fine, because everyone parents at their own pace. So, what’s a Pagan parent to do, if they’d like to keep their littles involved with ritual practice, but uncomfortable focusing on the AW YEAH SEXYTIMES part of Beltane? The first rule is: Don’t Panic. No kidding–you can absolutely celebrate fertility at Beltane with young kids. The trick is to remember that fertility doesn’t just apply to people, but also to the earth and the soil and nature all around us. That means things like flowers, baby animals, plants, seedlings, and all kinds of other things that you probably haven’t even though of in the context of fertility. Beltane is a time for great celebration, so there’s no need to exclude your kiddos. You simply have to find the context that works best for your family, and what you judge to be your child’s maturity level. Do keep in mind that everyone parents at their own pace. It’s not up to any of us to tell you you’re Not Paganing Right just because you’re not ready to explain human sexuality and fertility to your kids. You know your own kids better than anyone else does, and you’ll explain it when you–and they–are ready to have that conversation. So, moving on. Here are five fun ways you can celebrate Beltane with your young children, and let them participate in family rituals, without having to discuss certain aspects of the season that you’re just not ready to explain yet. Beltane is a celebration of fertility, and despite that it's a perfectly natural aspect of the human existence, let's face it: some parents may not always be comfortable discussing the erect phallus of the god or the open womb of the goddess with their young children. However, in addition to sexual fertility, the Beltane sabbat is also about abundance, in many forms. Don't just focus on material gains–it's about the growth of the earth and its bounty, and it's about increasing your own spiritual and emotional wealth. This family ritual is one that you can easily include children in. The light has returned, and life has come back to the earth. so this evening we plant our seeds. until the time has come for them to meet the sun. for its strength and life-bringing gifts. They travel upon the wind and bring to us abundance. all the bounty of the earth. for the gifts that are to come in the harvest season. and moistening this fertile soil. for allowing life to bloom once more. but Beltane is a time in which many things can grow. for other things we wish to see blossom. We plant the seeds of love, of wisdom, of happiness. We dig deep, and begin a crop of harmony, balance, and joy. We add water to bring life and abundance of all kinds into our homes. We offer our wishes into the fire, to carry them out to the Universe. Each person should write on their paper something they wish to see blooming in their own life–harmony, happiness, financial security, strong relationships, healing, etc. For small children, it may be something very simple–even if your first-grader writes down that he wants a pony, don't discourage anyone's wishes. After each person has written their wish down, they approach the fire one at a time and cast the paper into the flames (help little ones with this part, just in the interest of safety). When everyone has placed their wishes into the fire, take a few moments and think about the meaning of Beltane. Think about the things you want to see bloom and grow in your own life, in both the material and the non-physical realm. When everyone is ready, end the ritual. You may wish to follow the ceremony with another Beltane festivity, such as a Maypole Dance, or the traditional cakes and ale. For many of us, spring is a time when our creativity blooms as well. Invite your little ones to make May Day Cone Baskets to hang around the house, Floral Crowns to wear, string together some daisy chains, braid some ribbons together to hang in a tree, build a Faerie Chair for garden guests, or even try making masks representing the Green Man. Little kids are squirmy and full of energy. 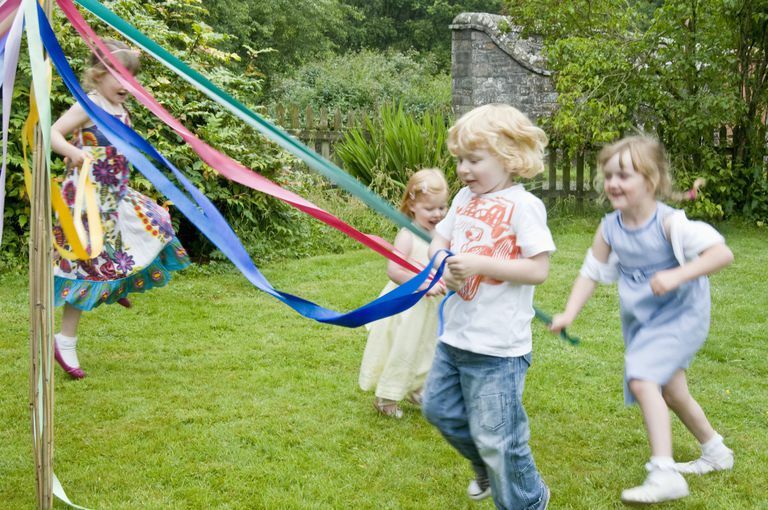 Put up a small Maypole in your yard, add some ribbons, put on a little bouncy music and get them dancing around it. Don’t worry if they get tangled up, it’s probably going to happen no matter what you do to prevent it. Host a children’s drum circle to raise energy. If you’re feeling really ambitious, let them build hobby horses out of wrapping paper tubes and tissue boxes, and hold a hobby horse race. It’s hilarious and fun. For many cultures, the Bale Fire was an important part of the Beltane celebration. If your kids are old enough to understand that they shouldn’t jump into the bonfire, get a roaring blaze going in the backyard, tell classic stories around the fire, and sing some songs. Kids love to be outside, so why not go on a nature hike to see what new things are growing in your local park or woods? Offer each child a small bag to bring home treasures they might find–interesting leaves, cool rocks and sticks, or other goodies. Take advantage of this to talk about the way the seasons change, and point out sights that show how life is returning to the earth once more.